A midsummer roundup is always going to be a little sparse! Too busy sweating to write reviews! We did okay on this challenge this month. We only missed one day, when my son's car door wouldn't shut and we had to make a long emergency pit stop at the car dealer and the kids fell asleep! 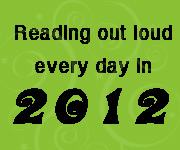 That makes 30/31 days on my read aloud challenge this month, which means I gave $5 to Kiva! I loaned to a group of women selling Guiness and other drinks in Ghana. 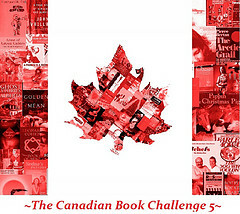 This month I started the Canadian Book Challenge #6. I read 4 books by Canadians (3 of which were picture books), which means I am on track to match my last year's total (48)! 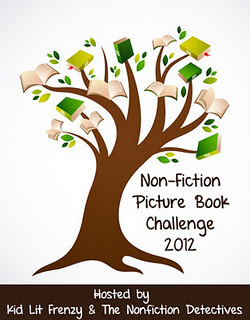 Next is the Nonfiction Picture Book Challenge 2012. In total so far I have read 18/20 books marked off already, with 4 new (How?, The Rescue of Nanoose, The Beetle Book, and My First Atlas of The World) in July. I hosted Nonfiction Monday here at Perogies & Gyoza on July 23rd, and it was great fun! Yet again I read nothing for the Reading the World Challenge this month. That must change in August. 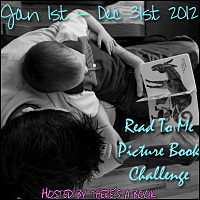 Trying hard to keep on track for the Read to Me Picture Book Challenge! This month we read How?, The Stone Hatchlings, The Rescue of Nanoose, Red Knit Cap Girl, The Beetle Book, Pussycat, Pussycat, Where Have You Been? and My First Atlas of The World to make 71/120, 7 over the last month. What are you reading this summer? Or are you in the pool too often to get any reading done?